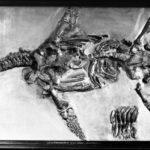 Smith (2015) provided a list of referred material: LEICT G221.1851 (the neotype specimen) from Barrow-upon-Soar, Leicestershire, UK (Cruickshank, 1994a, 1994b); NMING F10194, a partial skeleton including the skull (but no mandible) from Street (Smith, 2007; Benson et al., 2012); NMING F8749, a partial skeleton including a damaged skull and suffering from pyrite decay, also from Barrow-upon-Soar (Smith, 2007). A complete skeleton from Wilmcote, Warwickshire, UK, sometimes referred to ‘P.’ megacephalus (WARMS G10875, Wright, 1860; Cruickshank, 1994a) represents a new species (Smith, 2007). The genus Atychodracon was erected by Smith (2015) to accommodate ‘Rhomaleosaurus’ megacephalus, which deserved generic separation from Rhomaleosaurus sensu stricto (Smith and Dyke, 2008). A. megacephalus is closely related to Eurycleidus and some authors have regarded A. megacephalus as a distinct species of Eurycleidus. The original holotype specimen of A. megacephalus was housed in the Bristol City Museum and Art Gallery but was destroyed by enemy action during the Second World War. Surviving plaster casts of the holotype skull and forelimb allow for a modern diagnosis of the taxon. 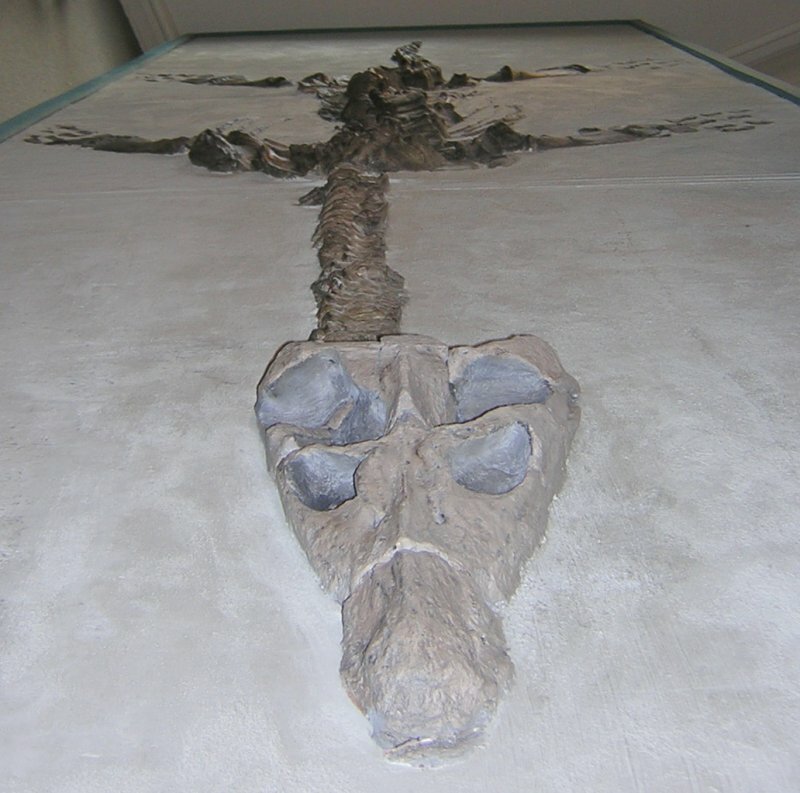 A neotype specimen of A. megacephalus was erected by Cruikshank (1994b). This fossil, nicknamed the ‘Barrow Kipper’ after the location where it was discovered (Taylor and Martin, 1990), is on display at the New Walk Museum in Leicester, UK. However, it is now regarded as a referred specimen (Smith, 2015). 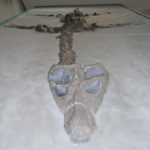 The skull of this specimen was described extensively by Cruikshank (1994b) and is also on display at the New Walk Museum in Leicester, UK (in a case adjacent to the displayed skeleton, which has a replica skull cast from the original). Cruickshank et al. (1991) proposed a specialised plesiosaur olfaction (or ‘underwater smelling’) system based on observations of the skull of A. megacephalus. 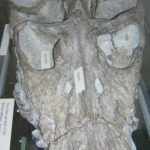 The internal nares (or bony nostrils) on the palate are positioned anteriorly on the skull, and anterior to the external nares on the dorsal skull roof. The internal nares are also associated with grooves that have been interpreted as an adaptation to channel water into them. As the animal swam, the flow of water over the external nares might have helped maintain hydrodynamic pressure. The flow of water through the nasal ducts could have been ‘tasted’ by olfactory epithelia. 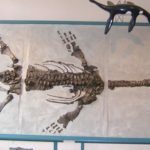 If such a system existed it might have been a common adaptation among plesiosaurians, since all plesiosaurs have anteriorly positioned internal nares (Brown and Cruickshank, 1994). Front view of ‘Rhomaleosaurus’ megacephalus (the Barrow Kipper) in the New Walk Museum, Leicester. ‘Rhomaleosaurus’ megacephalus (the Barrow Kipper) skull in the New Walk Museum, Leicester. 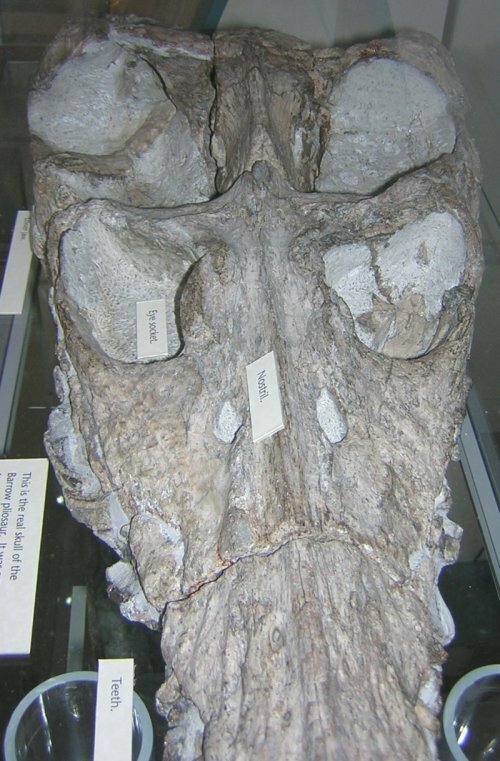 Holotype specimen of Atychodracon megacephalus in the Bristol City Museum and Art Gallery (from Swinton, 1948). The specimen was destroyed during the Second World War. The type specimen (BRSMG Cb 2335) was a complete skeleton exposed in ventral view, but it was destroyed during the Blitz. Plaster casts of the skull and limb are housed in the Natural History Museum, London (NHMUK R1309/1310); the Geology Museum, Trinity College Dublin (TCD.47762a, TCD.47762b; Wyse Jackson, 2004) and in the British Geological Survey, Keyworth, Nottingham (BGS GSM 118410).